Our Russia travel guide will unveil some Russia travel tips to help you plan your next trip to one of the most unique destinations in the world and pinpoint which landmarks are worth visiting. According to information presented in many traveling guides, Russia is the largest country in the world that takes approximately 1/8 of the Earth’s land surface spanning across 11 time zones and several climatic regions ranging from sunny seashores near Sochi to icy tundra areas in Siberia region. Magnificent Ural Mountains and Altai Mountains contribute to country’s significant natural resources. Russia is also a country that successfully combines rich historical and cultural heritage with a wealth of natural resources presenting plenty of sightseeing opportunities. Due to the fact that Russia used to be a rather closed to foreign travelers country before 1990’s, now it continuously draws crowds of curious tourists from all over the globe to marvel at its splendid people, landmarks and landscapes. If you are planning a Russia vacation in the near future, you simply must read our Russia travel tips that will help you learn about this destination. Due to vast territories that Russia boasts, it may be difficult to know how to plan your Russia vacation so you can see the most Russia attractions in one short week or two. Almost all Russian travel guides agree that your next Russian vacation should start from exploring its capital. Moscow is the capital of Russia and one of the most populated cities in the world with immense political, financial and cultural influences that has centered a plethora of things to do and see virtually for all types of visitors. If you are a first time visitor to the country, you just can’t go wrong if your start your cultural explorations from the capital. The Red Square, the Kremlin, St Basil’s Cathedral are all iconic landmarks that are seen by millions of visitors coming to get in touch with the rich and diverse history of Russia. If you are an art connoisseur, you should definitely pay a visit to the Tretyakov Gallery that has gathered some of the most magnificent paintings from Russian master artists. And certainly no trip to Russia is complete without attending one of the splendid performances at the grand stage of the Bolshoi Theater that presents world renowned ballet shows. 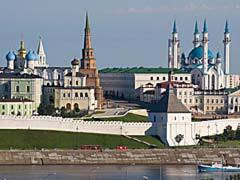 A lot of Russian tours and river cruises start from the capital and take you along the most famous River in Russia, the Volga River to unveil some of the most beautiful cultural gems of the country. 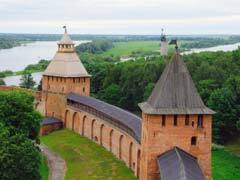 Taking Golden Ring of Russia tour around the capital is your chance to immerse in the early history of the country and visit incredibly beautiful places like Sergiev-Posad, Vladimir, Suzdal, Kostroma, Yaroslavl and Rostov the Great that boast a multitude of churches and cathedrals for you to explore. 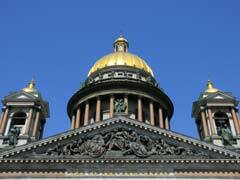 Saint Petersburg is very often referred as the Northern capital of the country. St Petersburg is blessed with an abundance of cultural venues ranging from the world famous Mariinsky Theatre to The State Hermitage, State Russian Museum, Academy of Arts Museum and many Imperial Palaces. In addition to major museums and art galleries, St Petersburg boasts a large number of Tsar Palaces and noble estates including the Winter Palace, Mariinskiy Palace and, of course, the “Russian Versailles”, the Peterhof. Because Saint Petersburg is situated on a multitude of rivers and canals it has rightfully earned its name “Venice of the North”. The city is supplied by a sophisticated bridge system comprised of over 300 bridges that is necessary to facilitate the city’s transportation services. City bridges create highly coveted among visitors spectacles at night when some of the historical bridges are raised to allow larger ships to pass through Neva River. The best time to visit St Petersburg is definitely during the summer months (June-July) to experience the northern phenomenon called Belye Nochi (white nights) that is caused by the high latitude geographical location of the city when the darkness does not descend on the city for weeks at a time and locals and visitors can enjoy broad daylight even in the middle of the night. If you are a traveler who likes the comforts that you come to expect from major European cities, you should definitely stick to touring the two capital cities, however, If you are really an adventurous type and want to experience what Russia is really all about, by all means head to the Northern Russia. In the rural parts of Russia travelers should expect less developed infrastructure and amenities but this fact is well compensated by an abundance of gorgeous sceneries and landscapes that you will be able to marvel at and the hospitality of Russian people. While touring the north of Russia, do not miss majestic and beautiful Lake Baikal located on the southernmost tip of the Siberian region that is blessed by a variety of wildlife and fish including Baikal sturgeon. If you venture to travel to the Far East of Russia, you should not miss touring one of the most significant sea ports of Russia, Vladivostok. Not that long ago the city had been off limits virtually to all foreign visitors so now you can take advantage of seeing Russian submarines and battle ships. If you dare to explore the most infamous Russian regions that used to be the place where a lot of political prisoners were deported to, consider booking a tour of Sakhalin and Kuril Islands that have been the subject of great territorial dispute between Japan and Russia. Kamchatka Peninsula is another unique travel destination that our guide recommends you visit in the Far East region that is blessed with fantastic natural beauties, wild life and marine inhabitants you will not come by in the central part of the country. Here you will catch a glimpse of the Valley of the Geysers, some of the world’s most active volcanoes and Natural Reserve parks. Our guide suggests that before you head to Russia, please be advised that in order to enter the country you must have a visa that could be obtained from the nearest Russian consulate. Please plan for your Russia vacation well ahead of time since visa process might take some time depending on consulate workload, especially in the anticipation of the approaching Sochi 2014 Winter Olympic Games. Our travel Russian guide recommends that you discuss with your doctor whether you might require any vaccinations before you go. And the last but not least Russia travel tips from our Russian travel guide are not to leave without experiencing this distinctly Russian attribute like “banya” which translates into a hot steam room that is used to not only clean the body but drive virtually any malady away and liven your spirits often followed by a very refreshing dip in icy cold water. Banya is one of the oldest Russian traditions that goes back many centuries in the history and is still widely enjoyed due to its healing properties despite modern amenities. Russian cuisine is certainly not to be missed, especially traditional vodka with caviar blini (crepes), pelmeni (meat dumplings) and delicious borsch (beet soup). Only after that you can say that you have visited Russia. Our Russia travel guide has introduced you to some of the highly recommended destinations that this great country has to offer and we hope you will come and visit soon.